‘Als de lente komt dan stuur ik jou’…. a Dutch song about spring and Tulips from Amsterdam. 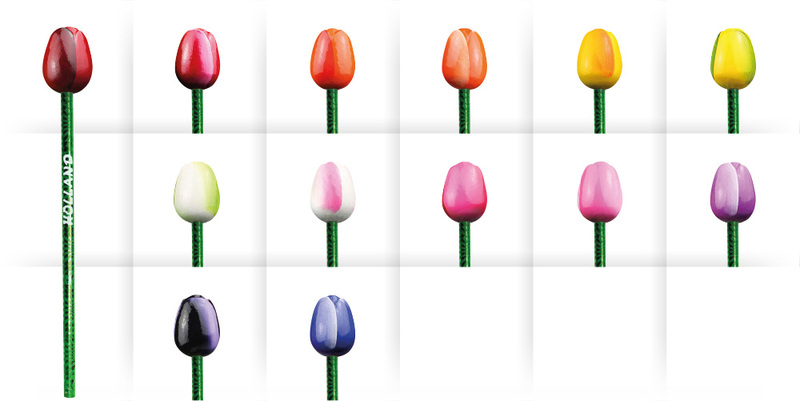 Nijhuis Klompen also produces a beautiful assortiment of wooden tulips. Completely made out of uit wood and hand-painted in 13 different vivid colours. 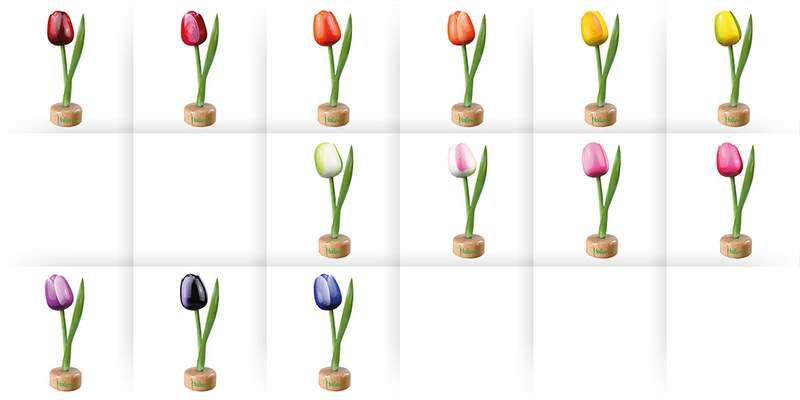 These wooden tulips are developed by ourselves and available in big and small sizes and in a big product range. 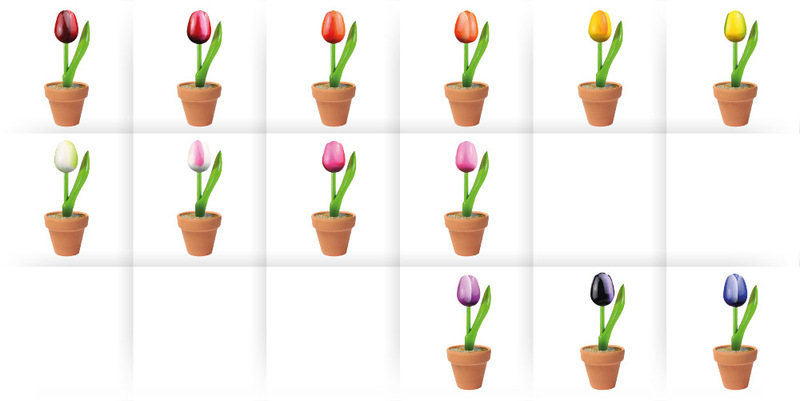 We have tulips on a stem but alsotulip pedestals, tulip magnets, tulips in a pottery, tulip bouquets, tulip bouquets in a Delft blue vase, keychains and a lot more. All in different sizes. A very big succes in the Dutch souvenir world, but also in the interior market in and outside the Netherlands. 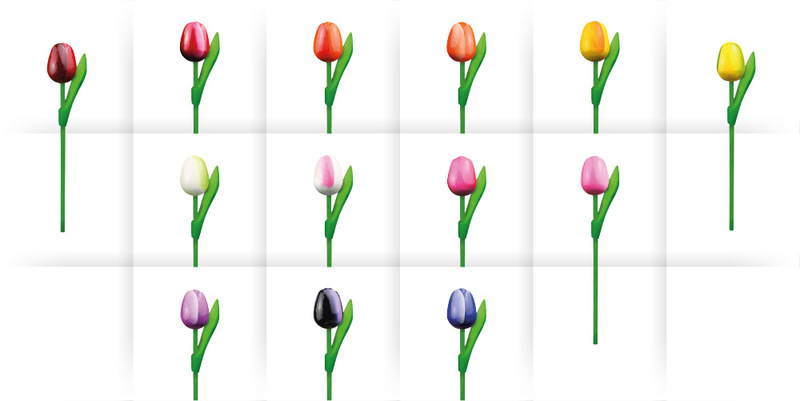 For our full assortment of wooden tulips please see our catalogue. The big wooden tulips from Nijhuis Klompen are a big succes in and outside the Netherlands. Completely made out of wood, finished by hand and in authentic oil paint and finished in high quality transparent lacker. Height of the tulips is 34 cm. Following the big tulip on stem we developed also a big wooden tulip pedestal on a foot made out of beech wood. These wooden feet are printed with a Holland or Amsterdam print. The height of this wooden shoe pedestal is 21 cm. 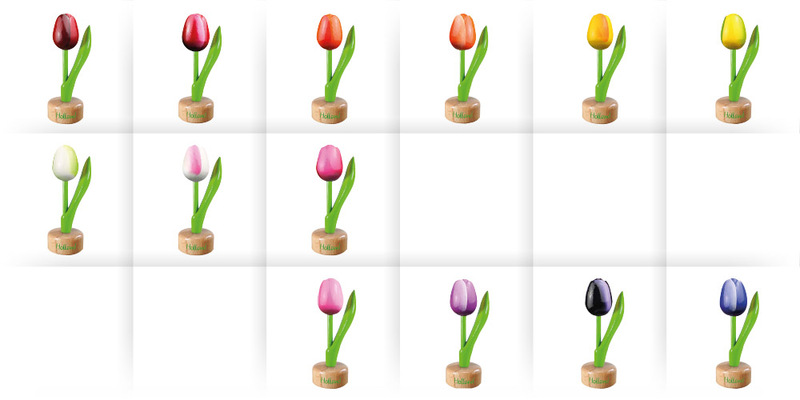 These tulip pedestals are also available as a relation gift, printed with your own company logo. Ask our sales-team for the possibilities. 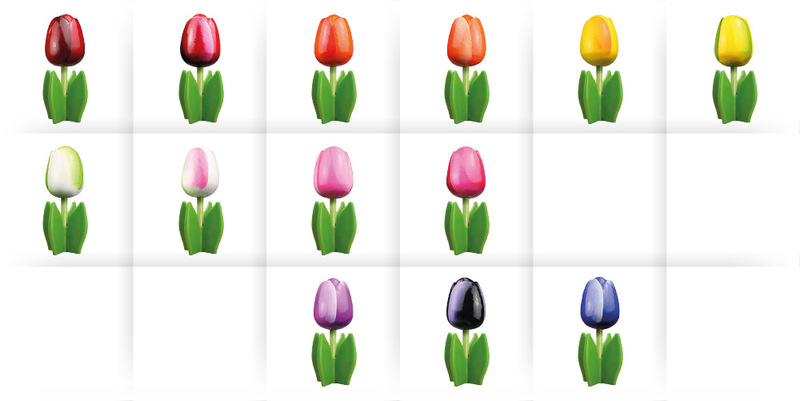 A very funny big tulip with a wooden bulb, hand-painted in oil paint and available in 13 beautiful colours. The height of the tulip on leaf is 14 cm. A very good article in every souvenirshop is without a doubt a magnet. 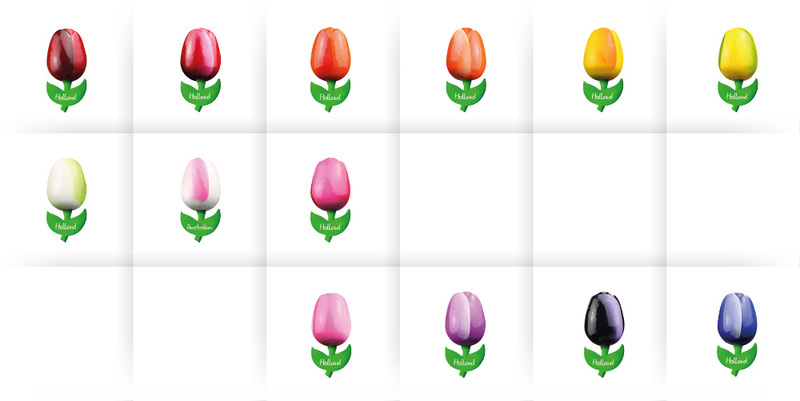 So we developed a very nice one in our wooden tulips line. The bulb is identical to the wooden tulips on stem and hand-painted. The leaf we developed is elegant shaped and printed with Holland or Amsterdam text. Nijhuis Klompen also has an assortment of wooden tulips as a bouquet, in a beautiful Delft blue vase and in a glass vase. Composed in proven combinations. A wooden tulip with a function; the tulip-bottle openers. Especially for these bottle openers we designed a well shaped iron part thats suits with the bulb and makes it a beautiful product. These wooden tulips bottle openers. Totally in style with the big wooden tulips, Nijhuis Klompen has developed a collection of small wooden tulips. 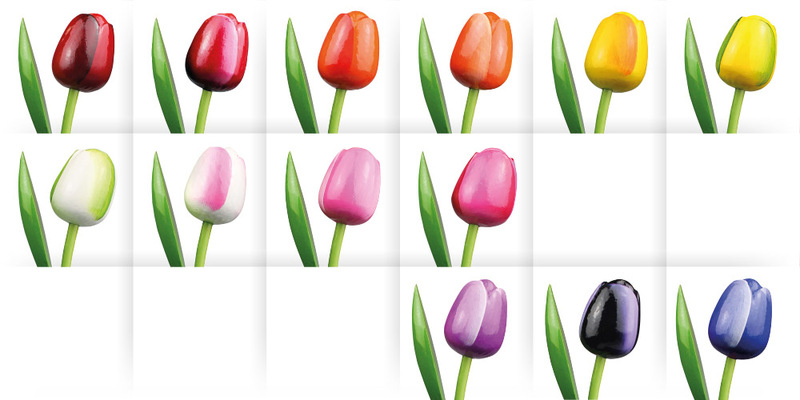 Also these wooden tulips are hand-decorated and available in 13 colours. The height of these small wooden tulips is 20 cm. The small brother of the big wooden tulip pedestal;… Funny and a nice product for every tourist. Height: 8,5 cm. 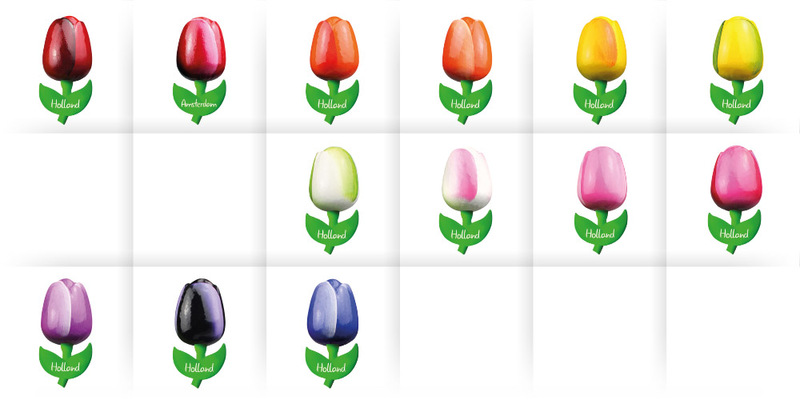 A series of funny mini-tulips as a magnet, printed with a Holland- or Amsterdam-print on the leaf. Height: 6 cm. 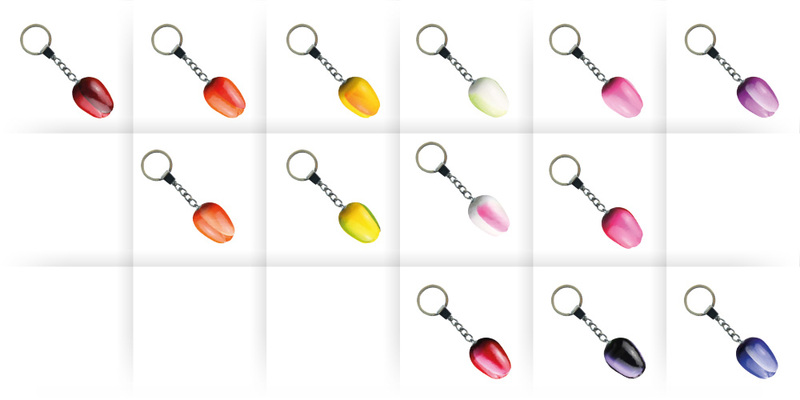 Our succesful keychains are also available in a tulip-edition. A colourful compliment for every keyring. Height tulip bulb: 3,5 cm. Grey never had such a lot of colour: due to the tulp-pencils of Nijhuis Klompen. 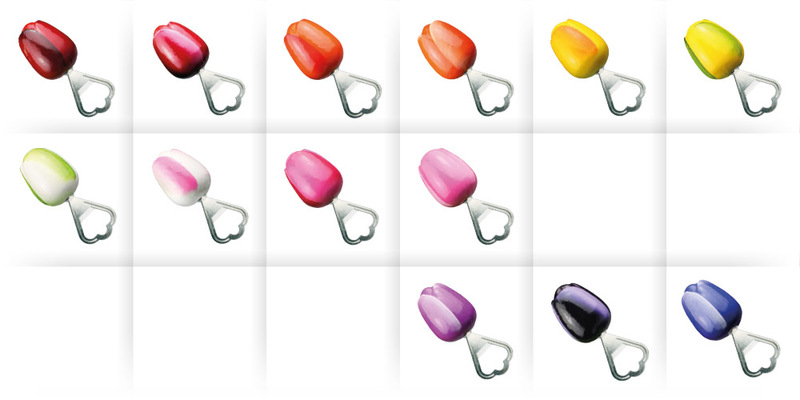 Printed with Holland-print and available in 13 colour-combinations. Also these tulip-bulbs are hand-decorated. height of the tulip bulb: 3,5 cm. Wooden tulips who are beautiful, but also have a function. 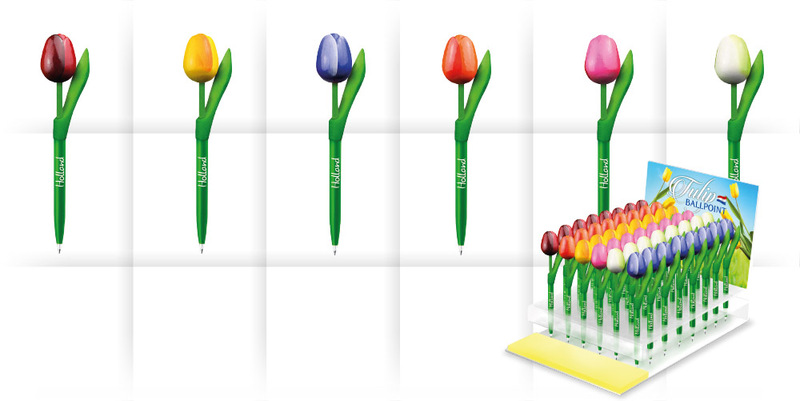 Those are the tulip-ballpoints of Nijhuis Klompen. With a top completely made out of wood, these ballpoints are without a doubt very succesful souvenirs. Our ballpoints are available with Holland- or Amsterdam-print. Nijhuis Klompen sells her small wooden tulips also as bouquets of 9 tulips and as a bouquet in a beautiful decorated Delft blue vase. Assembled in proofed multi-colour combination. ‘Cozy-dutch’! Our small wooden tulips in a pottery jar. Height:13 cm and available in 13 hand-painted colours.